With the success of their last Halloween themed Side Cast and posting on Saturday Night Movie Sleepovers where J.Blake and Dion Baia recommend some horror films they both feel may have fallen through the cracks or have been overlooked, the boys meet back at the Podwits studios to record a quick cast about the zombie genre. With the record-breaking premiere of Season 5 of The Walking Dead, they chat about some Living Dead films they think be have been forgotten and clutch for fans of the genre. 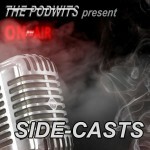 Come take a listen to this speedy, ‘commuter cast‘ the boys did on the fly for another installment of The Podwits Side Cast! Legendary Horror Director Dario Argento & Iggy Pop Need You!